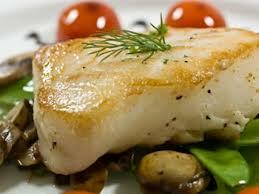 Jake's Chilean Sea Bass is a delightful offering of light flaky white fish. This special recipe comes by way of one of our loyal supporters with adjustments by yours truly. Preheat oven to 250 degrees. Clean and pat dry Chilean Sea Bass. Coat with Butter all sides. Cover with Jake's Santa Barbara Smoked Seafood Seasoning and White Pepper. Place Sea Bass on foil wrap and place on cooking sheet. Put Sea Bass in oven and cook approximately 20 minutes until Sea Bass is firm and flaky. When cooked through remove and garnish with lemon wedge and parsley sprigs.